The temperature of the crater lake had again been rising since early September, reaching a maximum of 40ºC on 4 October. Ruapehu's crater lake displays temperatures that follow periodic cooling and heating cycles that range between about 15 and 40 °C. In mid August, a record-low of 12 °C was measured, but New Zealand scientists have detected a rapid increase in temperature over the past days, along with increased seismic activity inside the volcano. Moderate levels of volcanic tremor continued, and analysis of water samples collected the previous week showed no changes in the lake chemistry. During recent visits, scientists measured a larger output of volcanic gases.  The Volcanic Alert Level remained at 2 (moderate to heightened unrest) and the Aviation Colour Code remained at Yellow. This was triggered by recent measurements that showed an increase in the degassing from Mt Ruapehu’s Crater Lake, a rise in temperature from 25 to 45 deg C since mid April, and ongoing moderate levels of volcanic tremor (reflecting the degassing). According to Geonet, such seismic swarms indicating small rock-fracturing events have been rare at the volcano in recent years. Ruapehu's typical seismic activity is rather dominated by events reflecting internal circulation of fluids such as tremor. “During April we recorded intermittently moderate to strong levels of volcanic tremor at Mt Ruapehu, however since April 28 the level has more than halved” reported volcanologist Brad Scott. The temperature of the crater lake declined a bit to from its peak of over 40°C in late January–early February 2015 to about 31°C in mid March and is now at 37-39°C. According to GeoNet, the current cycle is part of the normal behavior of the lake. The latest lake water temperatures readings and seismic recordings showed no particular signs of unrest in recent weaks and the volcanic alert status level has been reduced back to normal=green. 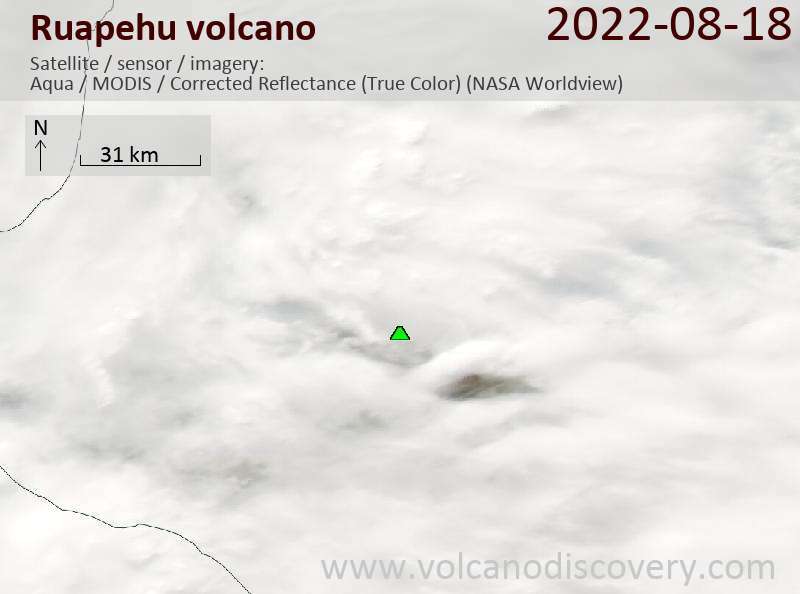 The Crater Lake temperature remains static at 22-25°C, which might indicate that a partial blockage between the deeper hydrothermal system and the Crater Lake remains. Current level of earthquakes remains low. Volcanic quakes and a slightly increased tremor signal are visible at Ruapehu. Small earthquakes are again more frequent under the volcano (after a low in activity at the end of Nov). On 3 December, GeoNet reported that monitoring data suggested that Ruapehu continued in a state of unrest. Scientists aboard an overflight observed that the crater lake was quiet and that the temperature remained steady at 22 degrees Celsius. Seismicity had decreased since the early part of November. The Alert Level at Ruapehu was lowered to 1 (on a scale of 0-5) on 9 October because no further eruptions have occurred since the activity on 25 September. Sunday morning at 10:47 am local time, a section of Ruapehu volcano's crater walls collapsed under the pressure of the crater lake. The sudden draining of the lake caused a devastating lahar that travelled down from its altitude at 2500 m to sea level. Fortunately, the flash flood of mud drained through a river channel and no people were injured or killed. Authorities closed roads and the nation's main trunk rail track near the southern base of the mountain on New Zealand's North Island. A similar event happened in 1953 killed when a lahar killed 151 people when it washed away a rail bridge, plunging a passenger train into the raging torrent of mud.